Galveston's Stewart Beach, Riviera of the Gulf. Galveston had been in the tourist business, like it or not, for 85 years before it ever occurred to anyone that a playground on the sand with lots of activities could be not only a tourist attraction but a money maker. In the late 1930s, Galveston's Mayor Brantley Harris was traveling along the Atlantic coast, where he saw the large public beaches like Rockaway Beach, Asbury Park and New York's Jones Beach. Mayor Harris was certain this idea should be used in Galveston. In those days, the westerly part of East Beach was owned by the Galveston City Co., a partnership in 1/3rd shares by Maco Stewart, the Sealy and Smith Foundation, and the Hutchings estate. The federal government owned that portion of the beach to the east of where the Boulevard and Ferry Road crossed, to the jetties. When he got back, Mayor Harris persuaded the Galveston City Co. to donate its portion of East Beach to the city. The city commission called an election for the authorization of the issuance of $175,000 in revenue bonds. Robert Cummins, a Houston engineer and architect drew the plans. Donald Boyce, who had been the assistant manager of Jones Beach, was brought in to supervise the construction and to manage the park. It would be called Stewart Beach Park. To help provide economic relief to Americans who were out of work because of the Great Depression, the Franklin D. Roosevelt Administration created the Works Progress Administration in 1935 which gave the unemployed jobs. The labor used to build Stewart Beach Park came from the WPA. They built a boardwalk, a building with a concession stand and restrooms, and cement slabs on either end of the boardwalk, one for dancing and one for roller skating. And there was a gift shop and the beach service office to rent umbrellas and chairs to bathers. 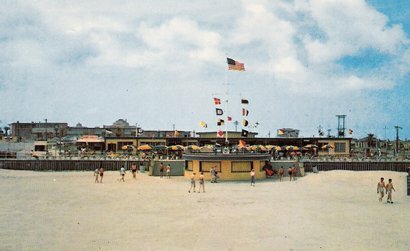 On July 18, 1941, Stewart Beach was dedicated. Mayor Harris' daughter, Margaret, broke a bottle of water over the prow of the SS Stewart Beach. And there were addresses by State Senator William E. Stone and State Representatives Sherwood Brown, Jr., and Donald Markle. Then it was time for the City Commissioners to speak. The crowd heard from George Glymer, Herman Bornefeld, James Tompkins and Adolph Suderman. At 9 that night, the great big band trumpeter, Frankie Littlefield, and his orchestra played for the park's first dance. The next year, Donald Boyce resigned, and the head of the business department at Ball High School, Fred Kingsbury, took his place as manager. Landscaping of palms and oleanders and grass was added. In 1946, and Austin man, Glen Dismukes, rented an area to put in miniature golf and archery. The following year, an amusement park of kiddie rides was added. In 1948, workers uncovered an old military shell road buried under the sand. It was cleaned up and resurfaced and lengthened so that it could be used as an air strip for a flying service that would give passengers a brief flight over the gulf. Herbie Reagan managed the skating rink, and Manning Smith taught square dancing on the dance slab. By the mid-1950s, there were Stewart Beach skaters square dancing on skates. It was such a novel idea that the nationally syndicated television program, Art Baker's "You Asked for It," featured it on one of its editions. In 1949, the Corps of Engineers turned over the remainder of East Beach to the city so that it could be added to Stewart Beach Park. An editorial in the Galveston News the day after the park was officially dedicated said, "Galveston was a little slow in realizing that a beach needs something besides sand and surf. Stewart Beach is the product of a policy which recognizes the provisions of satisfactory public resort facilities as a public responsibility.... Vision and private generosity made it possible.